Are you hoping that there is a compact sedan out there that’s perfect for you and your needs? If you haven’t found the right one yet, then clearly you haven’t been behind the wheel of a new Kia Rio yet. 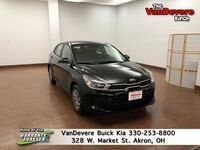 At VanDevere Kia, we can put you in the driver’s seat of a 2019 Kia Rio in Akron, OH today. We have a variety of options that you can try out and we would love to give you a full walk around to explain all the wonderful features available. You don’t have to wait for a walk around though. You can learn more about the Kia Rio below. 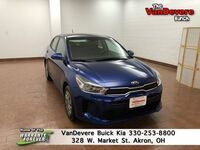 We also have a link right here that will show you our entire new Kia Rio inventory. We hope to see you soon, but until then, our inventory will be a good introduction to what we have to offer. For 2019 the Rio has a simplified trim level lineup. There are two trims in all with the base LX trim and the top S trim. No matter what trim you choose, you’ll get a sporty 1.6-liter engine that gives you 130 horsepower and 119 pound-feet of torque on tap. Not only does this engine give you the power you need, but it also gives you the efficiency that you want. In the city, you’ll get 28 mpg, and you will get 37 mpg on the highway. In other words, not only will the Rio save you money with a starting MSRP of just $15,300, but it will also save you money at the pumps. As standard equipment, of course you will get power windows and locks, but you will also get a 5-inch touchscreen that even includes SiriusXM satellite radio and Bluetooth connectivity with an auxiliary audio input jack. At the S trim level, you will get a 7-inch touchscreen that comes with a 6-speaker sound system and standard Apple CarPlay and Android Auto functionality. The S trim will even give you remote keyless entry and available LED headlights. 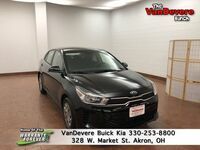 If you would like a Kia Rio in Akron, then come down to VanDevere Kia for a test drive. We can put you behind the wheel and we can even help you find the perfect trim level. If you’d like more information, then please click the link that we have below.